Yet another action-filled fictional tale starring real-life adventurer Sir Robert Carey (A Surfeit of Guns, 1997, etc.). In this fourth installment, Sir Robert has been called back from the north to London by his father, Anne Boleyn’s nephew Lord Hunsdon, to help find his missing older brother Edmund. Accompanied by his old friend Sergeant Dodd and his faithful aide Barnabus, Sir Robert sets forth on his journey, dodging bailiffs seeking to arrest him for unpaid debts. Once in London, he’s surrounded by a group of hard-drinking, hard-gambling courtiers, among them Christopher Marlowe and a surprisingly wimpy Will Shakespeare, who’s madly in love with Lord Hunsdon’s mistress. Carey also meets the Queen’s Vice-Chamberlain Heneage, who lives for no higher purpose than to impress the Queen and to bring disgrace to Lord Hunsdon and his family. 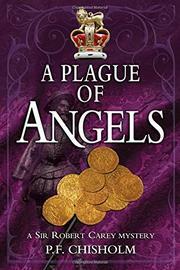 The plague-infested city gives Sir Robert and Sergeant Dodd little help in their search for Edmund—a search that eventually brings them to the Fleet, the filthy jail where they barely escape death but accomplish their mission at last. A splendidly detailed picture of 16th-century England, but the action is repetitive and not always convincing. A treat for history buffs; others may find themselves growing weary well before the indefatigable Sir Robert can afford to do the same.